I've noticed that there are several questions that lupus patients get asked repeatedly. I've compiled my own list of responses... edited from what I might normally say to make the responses less geeky. I've also deleted the expletives I might ordinarily be tempted to add. This list may be updated in the future, as there are probably other questions that I can't currently remember. Please feel free to ask your own questions in the comments, and I will do my best to answer them here. 1) What is Lupus? Lupus is an autoimmune disease. Autoimmune diseases occur when someone's immune system loses the ability to tell the difference between the body itself and invading germs. In a healthy immune system any cells that bind to the body's own tissues are killed before they can attack those tissues. For some reason this weeding out process goes wrong in lupus patients. So our immune system attacks various tissues and organs in our bodies because it thinks that, for example, our lungs are really germs. 2) What causes Lupus? This isn't fully known yet. (Anyone wishing to fund my researching this area, please talk to me after class). It is known that autoimmune disorders run in families (thanks a lot, DNA), but it's also known that the disease is not purely due to genetics. There are specific genes that are known to predispose someone to lupus, but we don't know what environmental stimuli kick a person from "more likely to have lupus" to "has full-blown lupus." As a side note to those who are still wondering, no, lupus is not in any way contagious. 3) What is a lupus flare? For most lupus patients lupus is a relapsing/remitting disease. This means it goes through periods of relative inactivity, followed by sudden increases in disease activity. When our disease suddenly becomes active we get really sick, even if we were healthy a month previously. This active time is called a flare, and it can last from a few days to years. Most of us have a few things that we know will trigger a flare, but sometimes despite our best efforts to avoid such things we will still get hit by a flares that seemingly come out of nowhere. 4) Why do lupus patients take chemotherapy? Most lupus patients do not have cancer. It therefore tends to confuse people when they find out that we are on chemotherapy. The answer is that chemo is designed to kill rapidly growing and dividing cells. In a cancer patient this is meant to target a tumor that is growing faster than the rest of the body. In a lupus patient the chemo will hopefully kill enough of the cells in the immune system, which are generally cells that grow quickly, to bring the lupus under control. The good news is that we don't have to take anywhere near as high a dose as a cancer patient for the chemo to do its job. The bad news is that we still have some of the side-effects associated with chemotherapy. 5) Why can't lupus patients drink alcohol? There's actually no reason why a lupus patient can't drink alcohol just because (s)he has lupus. However, a lupus patient on chemo really shouldn't drink alcohol. Chemo is toxic to the body, especially the liver. (I got pulled off of chemo partly because it was starting to mess up my liver). So adding alcohol, which can also harm the liver, to the mix will overwhelm the body and lead to irreversible liver damage. 6) Why can't lupus patients go in the sun? For many lupus patients the sun is evil. We avoid it like we would a mother-in-law in a bad mood. The short answer is that the sun will trigger a lupus flare more quickly than almost anything else. The long answer is that when the UV rays from the sun interact with the cells on our skin, the cells starts producing specific proteins that make our screwed-up immune systems go bonkers. 7) Why do lupus patients always seem to have a fever? When a non-lupus patient gets sick, his or her immune system may cause the body to have a fever as a way of killing whatever germ is causing the problem. Since lupus patients' immune systems think that tissues in the body itself are germs, it will cause a fever in an attempt to kill these tissues. Since (thankfully) it's a lot harder to kill a heart or kidney than a bacterium, these lupus fevers will often last a very long time. 8) What is a brain fog? The brain fog is one of the most irritating aspects of lupus, both for the patients and for those around them. Brain fogs are caused by a combination of sleep-deprivation, pain, painkillers, fevers and, in some people, the immune system attacking the brain itself. If you think about how spacey you feel when you have a bad case of the flu you can start to understand how we feel every day when we're in a flare. 9) Who can get lupus? Anyone. Males, females, adults, kids, etc. Women of "childbearing age" are most likely to be diagnosed, but there are plenty of men who also have lupus. Likewise, the disease is more common in people of certain ethnic groups, but is not restricted to those groups. If you have autoimmune diseases, such as rheumatoid arthritis (RA), multiple sclerosis (MS), Grave's disease, etc. in your family then you are at a higher risk for lupus, but (say it with me now) anyone can get lupus, even if there are no other cases of autoimmunity in their family. 10) Is there a cure for lupus? No. There are treatments that can bring the disease temporarily under control or help alleviate symptoms, but there is no cure for lupus. There have also been no new drugs specifically designed and approved for lupus in 50 years. This is what happens when you have a disease that mostly effects women, particularly in minority groups. Since lupus patients have traditionally not had a lot of political power, cures for lupus have not been a top priority for research funding. Aww, thanks so much! I'm so, so glad that it is helpful to you. If there are any other questions you can think of I'd be happy to add to the list. Thank you Sam for a great description and giving me some information about Lupus... We'd all love to have a magic wand, especially when it comes to a great gal like you! Do you plan to continue the research on lupus? Unfortunately, I don't work in lupus research. There are a variety of reasons for that, partly due to the fact that there isn't much funding for lupus research and partly due to the fact that I found when I was a master's student in immunology that I cannot perform experiments on animals without having nightmares. Since it is virtually impossible to study the immune system without working with animals, I was forced to work in a slightly different field. I will, however, continue to try to raise awareness and understanding of the disease. 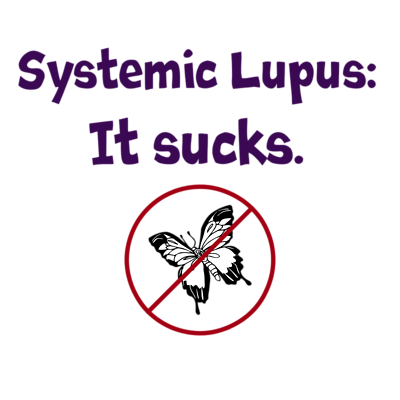 I think a large part of the problem is that people have absolutely no idea how many people around them have lupus or other autoimmune diseases, and I hope to be able to fix that, at least in a small way.